"An admirable work...compelling. A clear, informative account of the clash in the dark heart of the rain forest." "In a category of excellence of its own." Violent death came to Chico Mendes in the Amazon rain forest on December 22, 1988. A labor and environmental activist, Mendes was gunned down by powerful ranchers for organizing resistance to the wholesale burning of the forest. He was a target because he had convinced the government to take back land ranchers had stolen at gunpoint or through graft and then to transform it into "extractive reserves," set aside for the sustainable production of rubber, nuts, and other goods harvested from the living forest. This was not just a local land battle on a remote frontier. Mendes had invented a kind of reverse globalization, creating alliances between his grassroots campaign and the global environmental movement. Some 500 similar killings had gone unprosecuted, but this case would be different. Under international pressure, for the first time Brazilian officials were forced to seek, capture, and try not only an Amazon gunman but the person who ordered the killing. 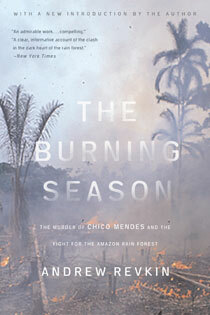 In The Burning Season, Andrew Revkin artfully interweaves the moving story of Mendes's struggle with the broader natural and human history of the world's largest tropical rain forest. "It became clear," writes Revkin, acclaimed science reporter for The New York Times, "that the murder was a microcosm of the larger crime: the unbridled destruction of the last great reservoir of biological diversity on Earth." In his life and untimely death, Mendes forever altered the course of development in the Amazon, and he has since become a model for environmental campaigners everywhere. Do you care about the environment? Sign up for our newsletter for the latest ideas and solutions from experts around the world. We typically send our newsletter twice a month. Sign up today!